#icecreamthurs is best in winter! Koko Black isn’t my favourite chocolate shop (Bracegirdles in Adelaide wins that accolade), but I was keen to try their winter menu, so a friend and I stopped by after dinner one night. 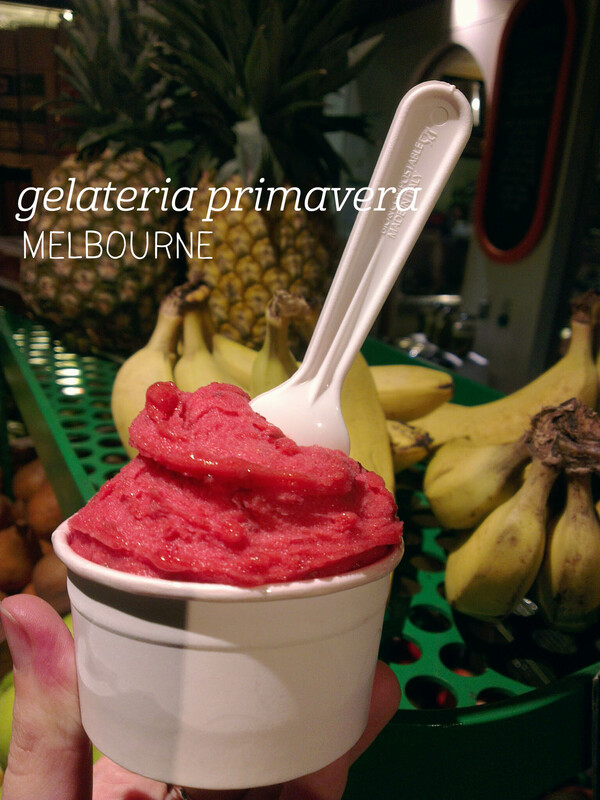 I couldn’t go past the Strawberry Sorbet spectacular ($9.50), served with a crisp lime meringue. Intriguing! The sorbet arrived in a chilled glass, with two large scoops and the flat meringue perched artistically on top. The sorbet surprised me on first scoop – remember how I raved about how amazing the Movenpick strawberry icecream is, with a strong strawberry jam flavour? 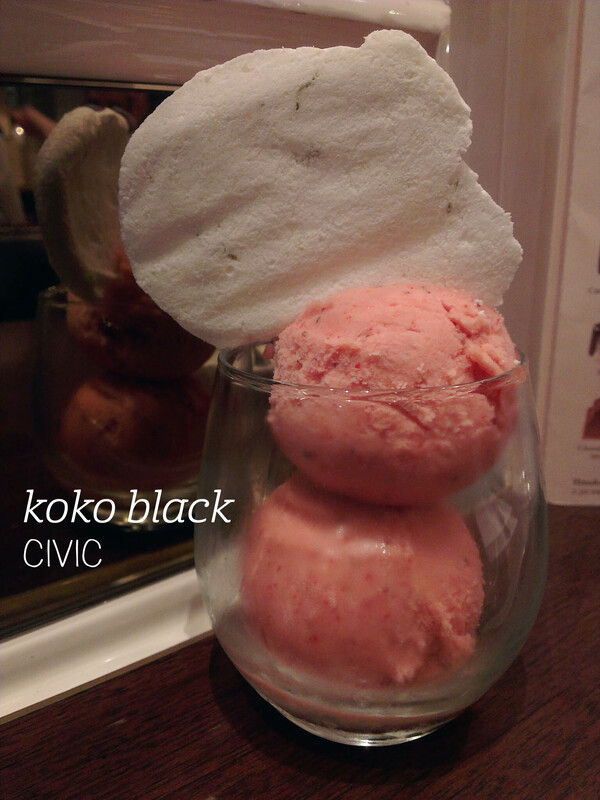 Well, fellow lactose-intolerant folk, get down to Koko Black, because this sorbet achieves pretty much the same effect without the dairy. I was delighted by the sweet-but-not-too-sweet buzz of strawberry flavour, with that intense concentation I so love at Movenpick. Of course the creaminess isn’t really there, but when the flavour is this good, ou don’t miss it. The lime meringue added another level of delight, bringing sharp, tart lime flavour to counteract the sweetness of the strawberry, as well as adding textural contrast. Highly recommened as we all try to pretend it’s still summer. There are egg and bacon rolls, and then there are egg and bacon rolls. 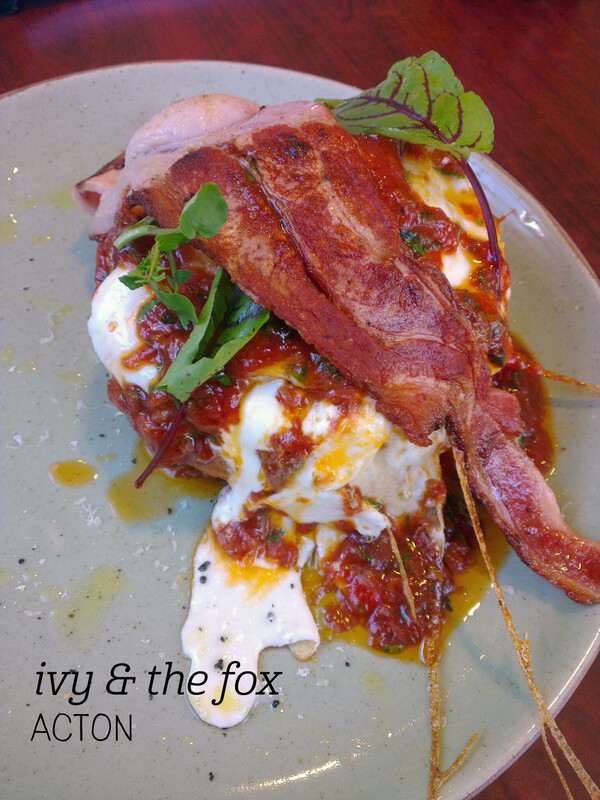 This is a top-of-the-food-chain egg and bacon roll, as one would expect from the expert kitchen at Ivy & The Fox. On a chilly Saturday I started out with the Pink Lady smoothie ($8.90), with watermelon, pear, pineapple and mint. 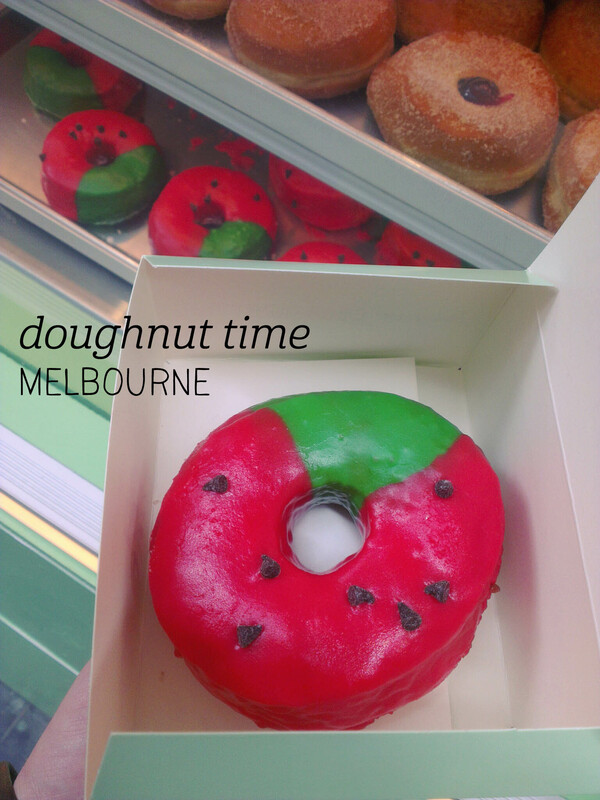 Disappointingly it was more like a juice – it still had great balance of flavour, but I had hoped for a thicker texture. The egg and bacon roll ($11) wiped away my disappointment. Beautifully presented, this is the sauciest roll I’ve ever had. 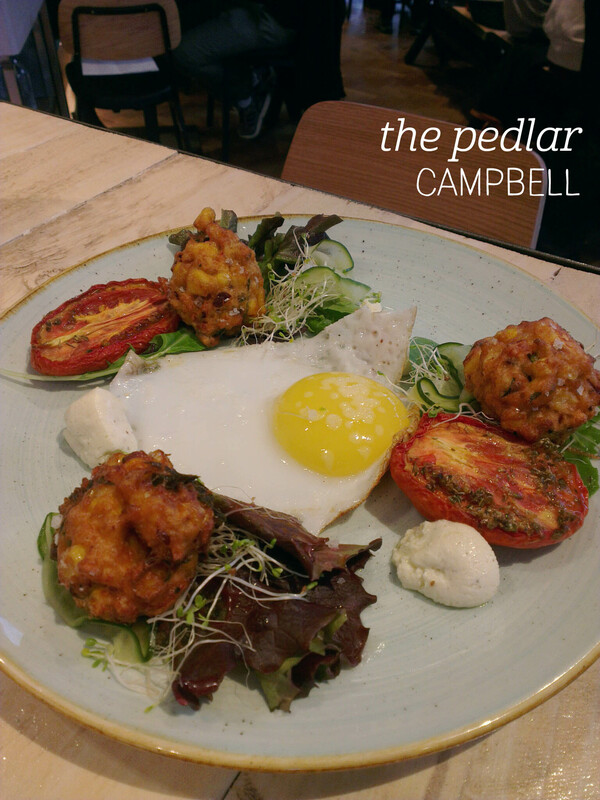 Topped with spicy relish and perfectly oozy egg yolk, there was plenty of bun to mop up with. The relish had such a great flavour – spiced with parsley and topped with tiny curls of cheddar cheese, it was well-seasoned and basically perfect. The eggs were huge and cooked just right, and the giant slab of bacon on top was nicely cooked (although it could have been a tad crispier at one end). The staff were friendly and the atmosphere was cozy by the fire. Definitely one to come back for. I very rarely take any of my leave in Canberra, so when I do, I always struggle to decide where to eat out! 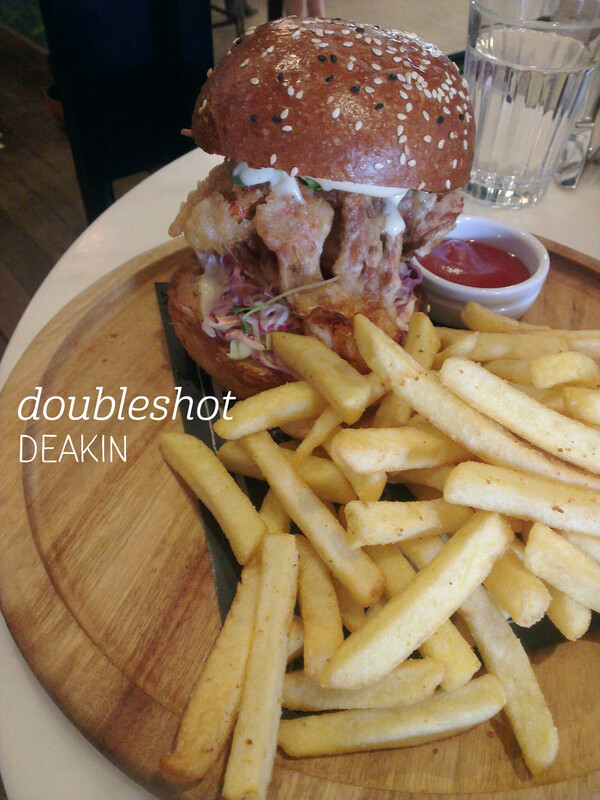 After much deliberation, I organised to meet a friend at Double Shot in Deakin for a long lunch. I’m always impressed with the friendly service here, and this visit was no exception. We were shown to a cozy table in the back half of the restaurant, and I ordered the Soft Shell Crab Burger ($23), which has tempura crab, wasabi slaw and microherbs on a brioche bun. The burger was huge and had a huge serving of fries with it, so already winning on the value front. The brioche was a good choice, adding a nice amount of sweetness to balance the fried crab and the tangy slaw. The crab was beautifully crisp and had great flavour – there was also plenty of it. I enjoyed the pairing of the slaw, which was fresh and went well with the Kewpie mayonnaise. The fries were nice, although could have been a bit crispier for my taste. 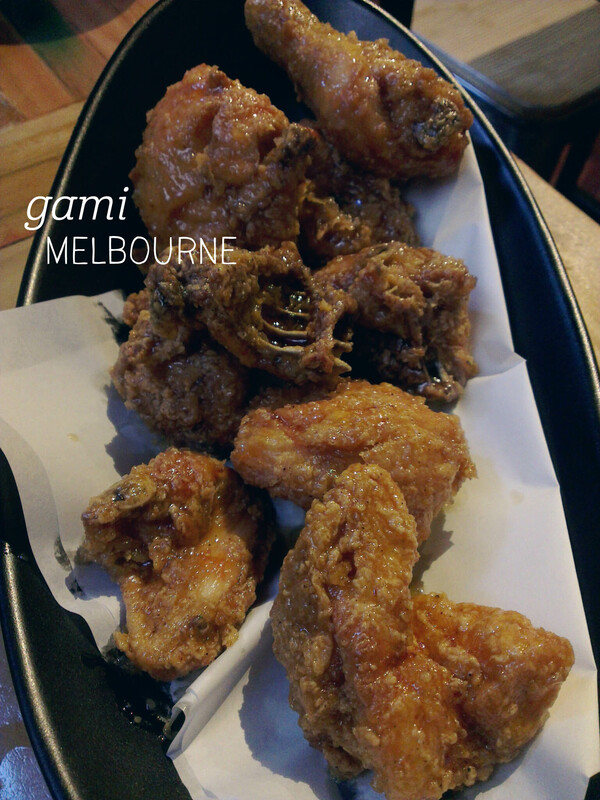 Double Shot is reliably excellent on all fronts – flavour, service and atmosphere – a great stop for a lazy lunch.